For many of us, Christmas is a wonderful and joyous occasion spent with family and friends, but for some families in need, it can be a very difficult time. A lot of parents experiencing financial hardship struggle to give their children the Christmas they had hoped for, which is where organisations like the Salvation Army step in. Every year in December, the Salvos host food and toy drives to support families who are doing it tough. 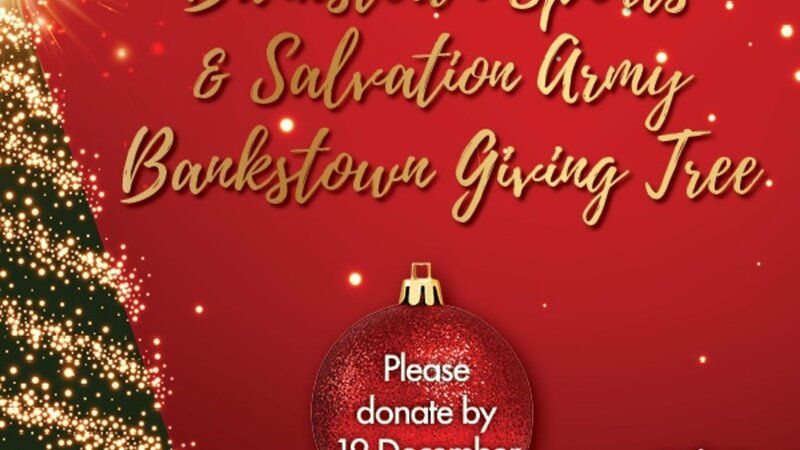 This year, Bankstown Sports has teamed up with the Salvation Army Bankstown and has set up a ‘Giving Tree’ where customers, staff and suppliers are invited to donate a gift or food item, that will make the festive season a little brighter for families in need in the local area. Pastor and Corps Officer Frank Wang has been working with the Bankstown Salvation Army since 2016 and says it is important to spread the festive spirit. “It is important for people to be charitable during this festive time of year and help those who are struggling. There is often a lot of pressure for parents to create a special Christmas celebration for the family, which is difficult to do when struggling with financial restrictions. It has been a long-standing initiative of the Salvation Army to support families during Christmas and each year we are impressed with the generosity of the community. We appreciate the support of Bankstown Sports”. Donated gifts must be new, unwrapped toys, books and non-perishable food items, and can be left under the 16ft Christmas Tree in the Mona Street foyer. These will be collected by the Salvos on 19 December and will be distributed in time for Christmas.